Sound Moves Festival is a platform for professional dance work being produced by choreographers and dancers in North Wales. It will be held at Scala Prestatyn 7pm on the 3rd November 2011. We are extremely excited to be curating the first festival of its kind in North Wales. The festival will showcase original work where choreographers and composers work together to create innovative performance. International choreographers and musicians such as Angharad Harrop and James Kelly will be presenting work as part of the festival, including award winning Dance Film Cynefin. 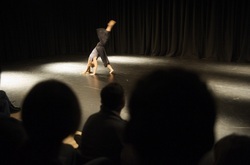 The aim of the festival is to showcase the contemporary dance work being made in North Wales and also to encourage the next generation of young choreographers in North Wales to start moving and making work.Please keep visiting for more information soon.